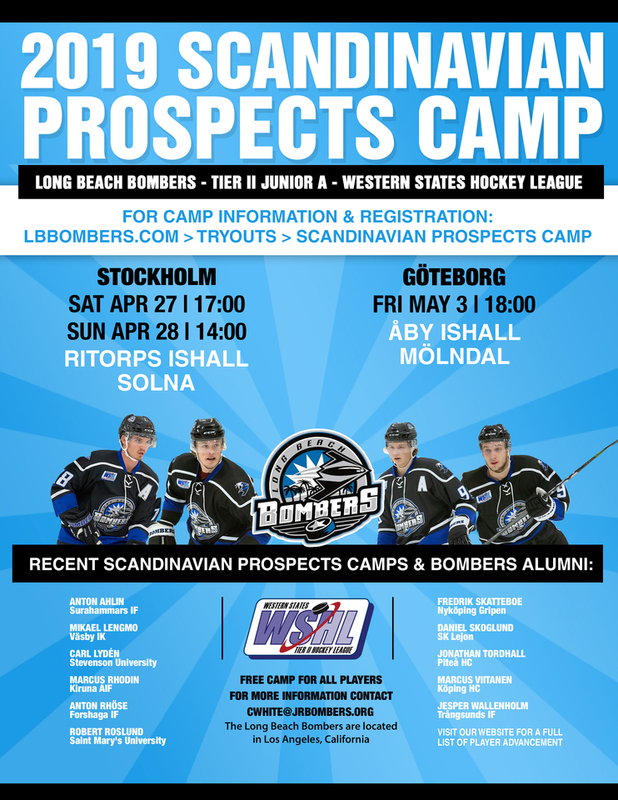 The Long Beach Bombers Tier-ll Junior A hockey club of the Western States Hockey League are hosting their 8th and 9th Prospects Camps, in Sweden. The Stockholm area camp will be held in Solna (Ritorps Ishall). The Gothenburg camp will be held in Mölndal, at Åby Ishall. The camps are free of charge to prospects born in the year 1999, or younger. In addition to the new prospects, many former Bombers alumni will be in attendance. Last year, players from Sweden, Norway, Denmark, & Latvia attended the Bombers two-day camps in Stockholm and Gothenburg. The Bombers are the first ever WSHL team to host a camp in Europe. The Bombers have signed over 30 players from their European Prospects Camps. 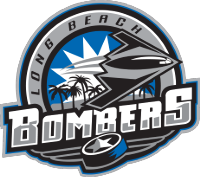 The Bombers have developed 50+ Swedes in their organization's history. The Bombers have signed players with experience at the following levels: World Junior Championships, National Teams, Czech Extraliga, Metal Ligaen, Belarus Extraleague, Allsvenskan, SWE Division 1, SWE Division 2, SuperElit, J20 Elit, J18 Elit, MHL, AlpsHL, and more. This year's team has featured ten players from Sweden. The club has moved 73 players to the college/pro level in the last 8 seasons, under Head Coach Chris White. The intention of the camps is to identify players born 1999 and younger, for the 2019-2020 season. Head Coach / General Manager, Chris White, will be organizing the event. Please fill out the registration form below, and Coach White will contact you. Rosters will be limited, based on the amount of registrations, and players' hockey résumé. The WSHL allows teams to have up to 14 import players.